You don't want to mess with Mr. Midnight. yep - strangely warm - I can hear the little peeper frogs in woods around us this morning! Crazy warm. It's 5"C where I am in Canada and the little bit of snow is melting. Again. Very strange. Still need the firewood though - it's damp instead of bitter cold. Guarding it from the pesky mouses. So cute! 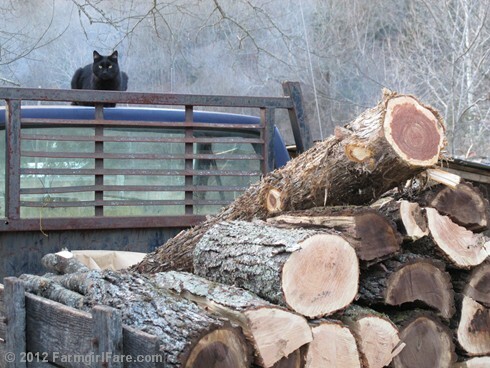 Your firewood is safe for sure. Super warm here in Minnesota, too. It's weird! It seems that it's been a freak-ishly warm winter in a lot of places this year. It's hard not to wonder what that means for this summer and water issues???? Love Mr. Midnight - too cute!